Syllabus of the Online Course (Subject): Niger Basin Authority (NBA) - West Africa. 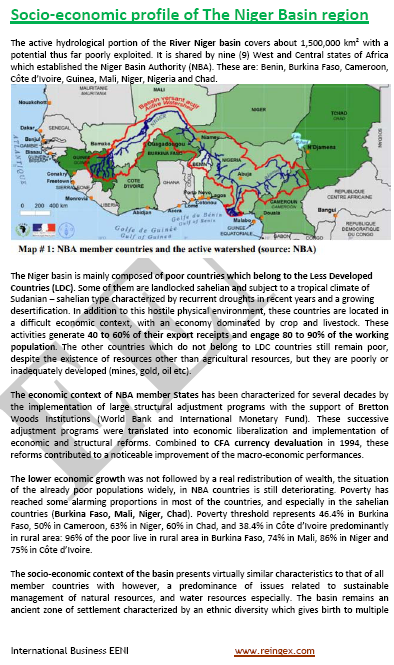 Socio-economic Profile of the Niger Basin region: Benin, Burkina Faso, Cameroon, Chad, Ivory Coast, Guinea, Mali, Niger, and Nigeria. Description of the Online Course: Niger Basin Authority (NBA). In 1963 entry into force the agreement of the Niger Basin Commission. In 1980 was renamed to Niger Basin Authority. Today the Niger Basin Authority is a regional economic institution formed by nine countries of West Africa and Central Africa: Benin, Burkina Faso, Cameroon, Chad, Ivory Coast, Guinea, Mali, Niger, and Nigeria. The main objective of the Niger Basin Authority is to encourage economic development between member countries, mainly in the Niger River water resource management. The Shared Vision of the Niger Basin reflects the mission of this organisation. The Niger Basin Authority belongs to African Civilisation.